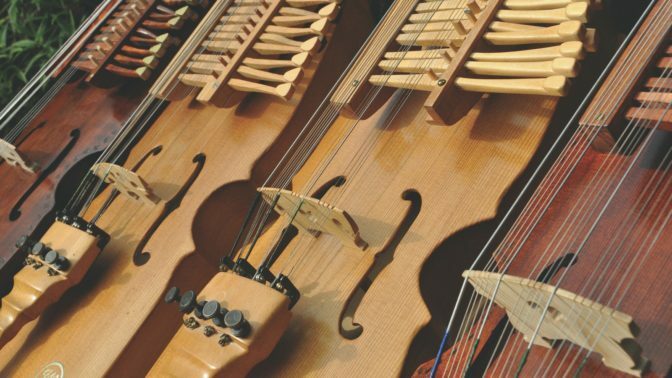 The ‘tutors’ concert’ for our Harpas at Halsway Festival is something rather special, featuring as it does two of the finest players from Sweden together with the UK’s foremost Nyckelharpa specialist Vicki Swan. Josefina Paulson (Sweden) embraces the Nyckelharpa’s many possibilities, from the roots of the Uppland tradition, to its large crown of new influences from other cultures; she is a musician standing grounded in her own tradition, yet exploring new territory. In Delsbo 2008, Josefina was awarded the title “riksspelman” (national folk musician) by the ZornJury “for playing the nyckelharpa lively and skillful, in the tradition of Uppland”. In Västmanland, she received the 2009 Cultural Award from VLT – “Josefina IS music”. In 2011 Josefina received the “Bror Hjorth Scholarship” with the jury’s assertion “technically brilliant, very committed performance on the keyed fiddle with both the preservation of cultural traditions and a gentle personal and creative rejuvenation”. Josefina has studied the one year course at Eric Sahlström Institutet and also has a degree in music, with the Nyckelharpa as main instrument, at the Royal Academy of Music in Stockholm. Torbjörn Näsbom was born in Kyrkbyn, the home county of the nyckelharpa. He has played as a duo with his brother Pär for as long as he can remember. The boys learned to play the fiddle from their father, and growing up in a house full of music came in contact with many fiddlers and folk-musicians. Eric Sahlström was one. And so was Viksta Lasse. It was only natural for Torbjörn to play around with keys and tuning understrings strings, and while the nyckelharpa has now spread all over Sweden and beyond her borders, no one plays it quite like Torbjörn.